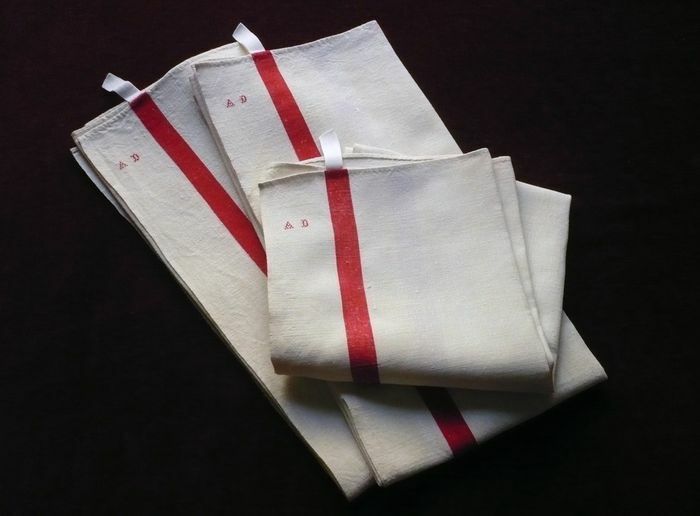 As French as kitchen towels go this lovely set of three towels is typically striped in red down each side and bears a small monogram, "AD," embroidered in red cross stitch in one corner. They're loomed of an excellent quality of finely woven and very supple ecru "fil de lin" linen - absorbent, fast drying, and very stain resistant! Each towel has a small linen loop for hanging. These towels are in new, never used condition and were only first washed to freshen them up after a long period of storage. Early to mid 20th century. Hand hemmed. An additional set of two identical towels is available upon request. Dimensions: 33 x 23.5in.